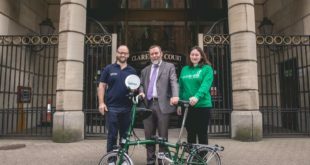 Sustrans has branded the government ‘short sighted’ following the announcement that £24 billion has been set aside to undertake the largest road building programme since the 1970s. With works set to be undertaken between now and 2021, the Government is expected to be spending £3 billion annually on maintenance and repairs by the end of the next Parliament. Transport minister Robert Goodwill said: "We need to make sure we have the right people and equipment in place to deliver the 53 road schemes in preparation right now, plus the next generation of improvements over the next 7 years. This means taking on more apprentices and making sure suppliers have the capacity to deal with the increase in demand. If we get this right, this will provide road users with a high performing network that can cope with the expected 43 per cent increase in traffic over the coming decades that will help boost economy growth and deliver more efficient roads for motorists." There is a silver lining to the otherwise grim reading, in that £6 billion of the funding is to be spent on tackling potholes on local authority roads.